Mauritius may offer you warm sea and hot sun if you like to lie on a snow-white beach. Anyway it is not the end of the activities which you can do in Mauritius. 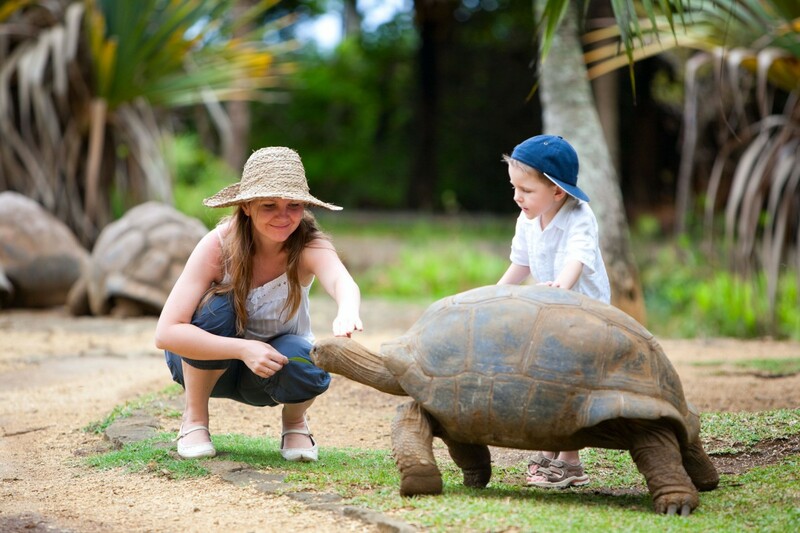 Mauritius can provide different attraction activities. We can offer top 10 places to visit in Mauritius for you to enjoy the opportunity to choose around the places which you can visit in Mauritius so you will remember your vacation forever and ever. 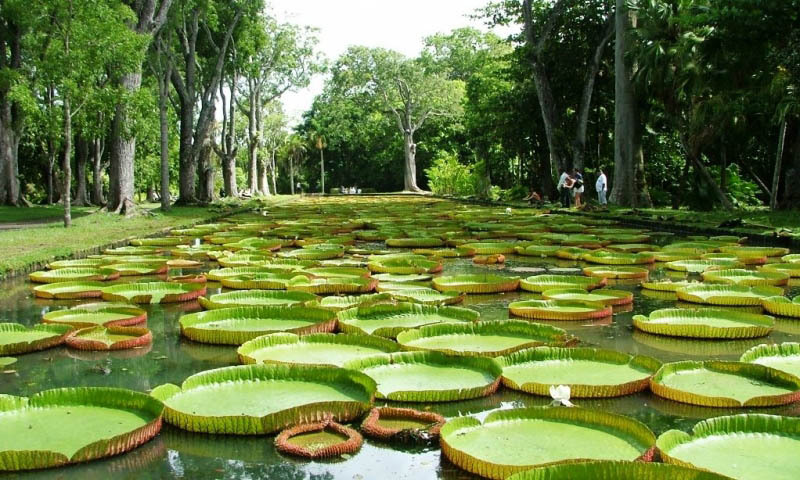 Among places you should see in Mauritius is the Botanical park. It is located not far from Port Lois and spreads over more than 37hc. The garden has a large collection of palms from Africa, Asia and Indian Ocean islands. It is also well known due to the giant water lily pond. Coloured Earths of Chamarel which is one of the must-visit places in Mauritius is a natural monument that lies near Chamarel village. There you can see a geological formation where sand dunes turned into different colours as a result of chemical reactions. Mont Choisy is a little town that attracts many of beach-related rest lovers as well as people who want to see incredible turquoise water, shining white sand shaded by palms. In Mauritius Leisure Village Water Park you can find rides and pools for comers and goers and after you can relax in a café located at the territory. Blue penny is a little paradise for a stamp collector. There you can see some of the rarest stamps in the word: two Mauritius ‘Post Office’ stamps. These Blue Penny and Red penny are shown only for 10 minutes per hour to save their colours. Victoria 1840 is an old sugar cane processing plant of colonial era. Nowadays it is an art museum that has works of a French painter Yvette Maniglier (his master was Matisse) and a restaurant named Le Café des Arts. Tamarin Beach is a relatively wild bay. The reason is quite strong winds and currents. However, it is a perfect place for windsurfing and surfing. Also you have good chances to see dolphins. Casela Nature and Leisure Park covers the territory over 14 hectares. The Park is a home for more than a 1500 birds and many animals such as lemurs, lions, tortoises, monkeys etc. The park also has a botanical garden full of beautiful flowers. You can enjoy the graceful birds in Île aux Aigrette - a nature reserve of Mauritius flora and fauna where you can see pink pigeons and some other rare animals and plants. Going there do not forget comfortable shoes and drinking water. Meet with the thousands of crocodiles in La Vanille Réserve des Mascareignes. This place will definitely impress the visitors by a great number of animals and insects. It hosts about 1000 tortoises, 2000 Nile Crocodiles, and many others. It also suggests children playground among trees and birds. At the space where the azure sea comes across with the snow-white sand, there is the unforgettable place for incredible relaxation. Pamplemousse Botanic Garden is placed among cozy bays where grow rare trees and plants which are the sources of many popular spices. Pamplemousse Botanic Garden is one of the oldest parks in the world. The park’s area is 25 hectares and inside it, there are over than 500 different species. Back in 1770 at the time when the island was in the French dominion, a botanist and the Intendant of Mauritius Pier Puavr founded the garden for growing plants and producing different spices from them. Later his followers started planting laurel trees and the famous breadfruit. Also some time ago there were lots of kitchen-gardens, vegetables from where were delivered to the cuisine of Governor of Mauritius. The distinction of the Pamplemousse Botanic Garden is that lots of the trees were planted by the famous political leaders of major world powers with Francois Mitterand, Indira Gandhi and Robert Mugabe among them. Today the park is a rather crowded place, the garden is popular not among numerous tourists but amid local people too. Among the sights of the park is the luxurious colonial mansion Le Chateau de Mon Plaisir. Not so far away from it, the charming lake with water pink, white and blue lilies is located. If you take the direction to the south-west from Mauritius by the itinerary among the vast sugar cane plantations growing near the exotic fruits, you reach the famous fabulous Colored Earths of Chamarel. Colored Earths may be the most popular and famous showplace of Mauritius which acquired its fame among the tourists from all parts of the Earth. 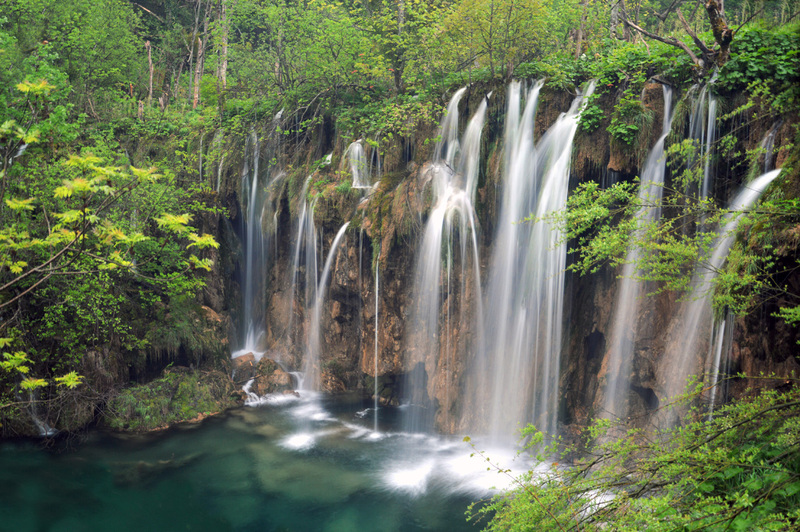 The first that meets travelers is the sumptuous grand waterfall which falls down from the rock hundreds of feet down. Elegant graceful water flows pour down to the jungles which are placed beneath. 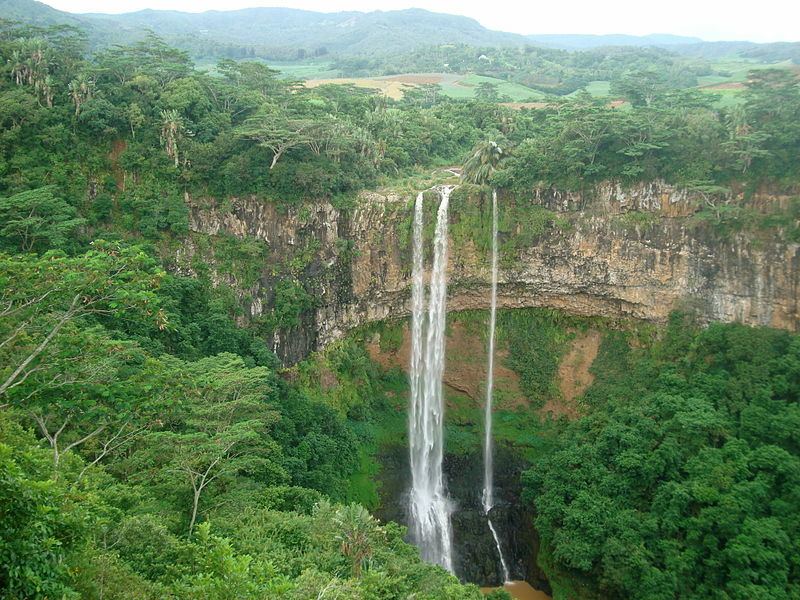 The beginnings of Fabulous Chamarel Falls open in the biggest national park with the mystic name of Black River Gorges. The river branches are falling down to the huge immense crater of an extinct volcano. Fortunately, today you can observe fantastically beautiful tropic plants instead of bubbling lava. The name of Coloured Earths of Chamarel park is not only a nice beautiful name or a poetic idea. The soil in the ground really has different colors – pink, yellow, brown, blue and orange. Especially surprising and interesting for the tourists is that none of the colors, the soil, and the formations of the earth are mixed, which creates a really impressive and effective picture. You will enjoy observing that spectacular view and may be impressed and amazed by it. Mont-Choisy is a small cozy town placed in the coastal zone. You will be delighted to observe the variety of tropical trees and enjoy the long snow-white sand beaches and pure clear water. Exotic tropical gardens, comfortable hotels, bars and restaurants presented in an impressive amount attract tourists from all parts of the world. 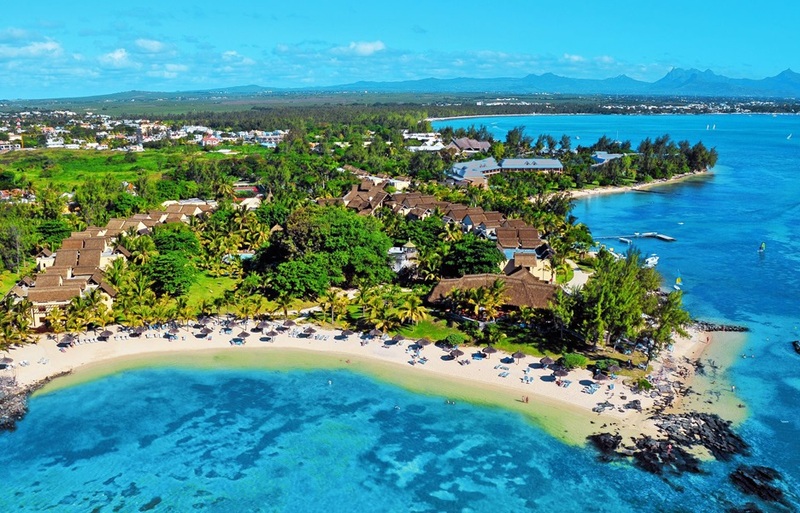 Nevertheless, the main treasure of the resort is «Mont-Choisy» beach, which has the same name as the town. Enjoy 3 kilometers of snow-white sand, which extends 20 kilometers from the capital of Mauritius named Port Louis. Coastal azure waters of the Indian Ocean amaze by their clearness and beauty. 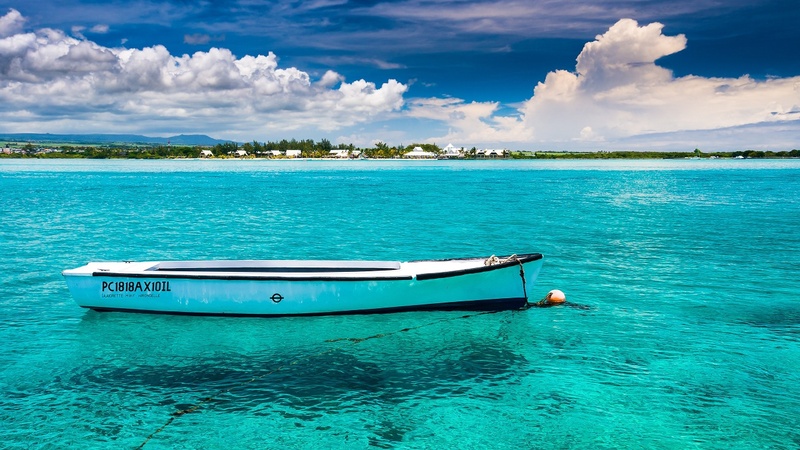 Numerous diving centers in Mont-Choisy will offer to have a pleasure of having a small touristic voyage on the glass bottom boat or of fishing in mid-ocean, and you may enjoy feeling the waves of the Indian Ocean and having a ride on catamaran or water ski. Off course, you can also try kayaking and windsurfing, for a fee you will find out more about all the beauty and diversity of the underwater world. Lots of hotels on the resort territory guarantee you that there will be no problem of choice if you have taken the decision to spend a vacation on Mauritius. 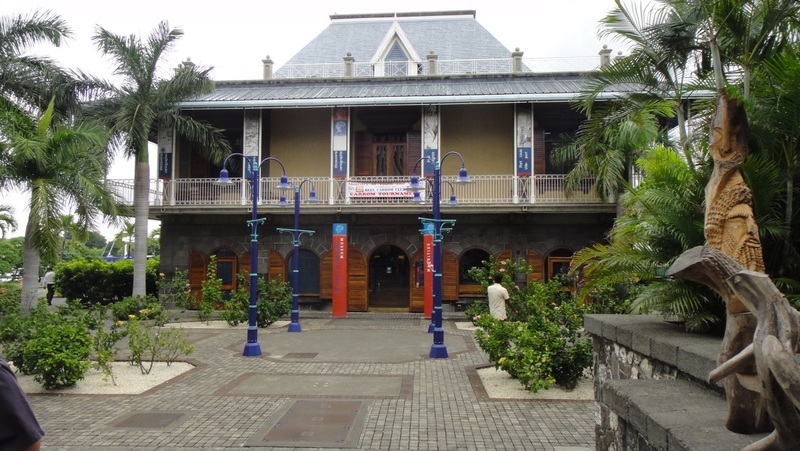 Blue Penny museum, or more precisely Museum of Blue Mauritius, is placed in the heart of the island in Port Lois and dedicated to the post stamps. It was created by the initiative of the Mauritius Commercial Bank and its main treasure are the very first island’s stamps dated 1847. They were bought by the Commercial bank of Mauritius on the Switzerland auction and costed two million dollars. For the purposes of ensuring the maximum safety of such expensive stamps, originals are rarely exhibited to the world, the copies are usually displayed. Did you know that Mauritius is the third country in the world which started to issue its own stamps? However, an occasional mistake had taken place, as it was found out later, it was a happy incident, and instead of «Post paid» on the stamp there was written «Post Office». As a result, it became one of the rarest post stamp in the world which exists in two kinds «Blue Mauritius» (it costs 2 pennies) and «Pink Mauritius» (it costs 1 penny). In the museum, there are a lot of things that can help you explore and study the culture of the island, other post stamps, old marine maps, engravings, pictures and documents. All that is the acknowledgment of the old rich culture of Mauritius and the evidence of reverent attitude of the state to its traditions. On the coast of Trou d’Eau Douce there is Victoria 1840 very original and unique center of modern art. Earlier, in the colonial age, there was a sugar plant. Nowadays it is rather difficult to find out such old buildings which can remind us about the past time of prosperity of the sugar industry. Try to immerse yourself in the history of Mauritius and enjoy the cultural heritage of the island. However, in one of the reconstructed buildings which earlier was Bo Plan factory an art space was organized by the Maniglie fund (who personally was a student of the legendary Henri Matisse) with the Museum of the modern art and imaginatively designed restaurant «Le café de Art». Inside the cultural center, the atmosphere is unique and special – you can feel amazing renaissance and it seems as if you were on a theatrical performance. The museum guests can penetrate not only into the atmosphere of the colonial age but also discover about the life of typical sugar plantations, how it was produced and was traded with the whole world. Lots of attention is paid to the slaves brought from Africa, the slave trade and in general. At the end of the excursion, you can taste 15 varieties of raw sugar with great rum offered to it. The Tamarin Bay – calm resort on the west of Mauritius. Even the local people of Mauritius can't help admiring the incredible beauty of Tamarin bay which is one of the favorite places on the island. Snow-white sand beaches remember the good old days penetrated by the nostalgic sense of the old Tamarin hotel, which seems not to have changed since the year «Jaw» movie was released. Santosha bay is the old name of that Tamarian bay, some signs on the buildings still carry the old title. Even at that time, this place was the centre for numerous surfers among the local people. Although there was the unspoken rule among them not to talk a lot about the best place on the Earth for surfing in order not to attract the tourist crowds. By the way, because of the changing streams it is impossible to «catch the wave». But these beaches are excellent for sunbathing, pure warm water calls everyone for swimming. In the evenings, all bay dives in miracle jazz rhythms and the enchanting spectacle starts to begin. In order to sense the special harmony with the nature you should pass from the beach to the southest Volmar's point. You will see extremely beautiful places; however, you cannot reach them by car. By the way, it is not recommended to walk alone. 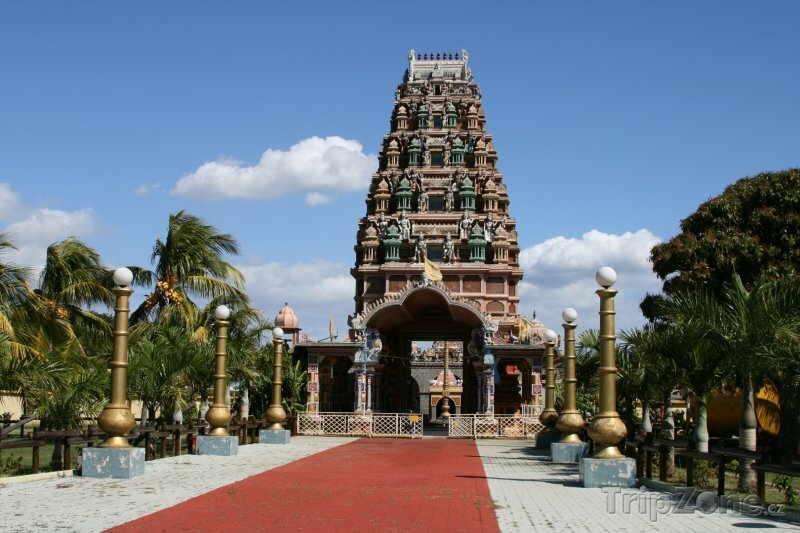 Casela park on the Mauritius island is a private reservation and an entertainment center. Casela park extends for 25 hectares of spectacular scenery where exotic animals and colorful birds live. The pink pigeon, if we speak about the feathered race, is the king among the park birds. It is a distant relative of the dodo bird. Unfortunately, that beautiful specie does not exist on the Earth anymore, nevertheless blue pigeons could be found on the Mauritius island but only in the number of 250. The king of the animals also exists on the island. The bravest ones can enjoy the views and habits of the royal lion. Among the other cats, there are cheetahs and leopards, and you can even stroke them. Even that connection between humans and animals is carried out under the strict supervision of a specialist you should be brave enough to go in for it. But it is not dangerous if we talk about lemurs, zebras and monkeys – you can easily make funny photos with them and there is no risk of losing any important parts of the body. 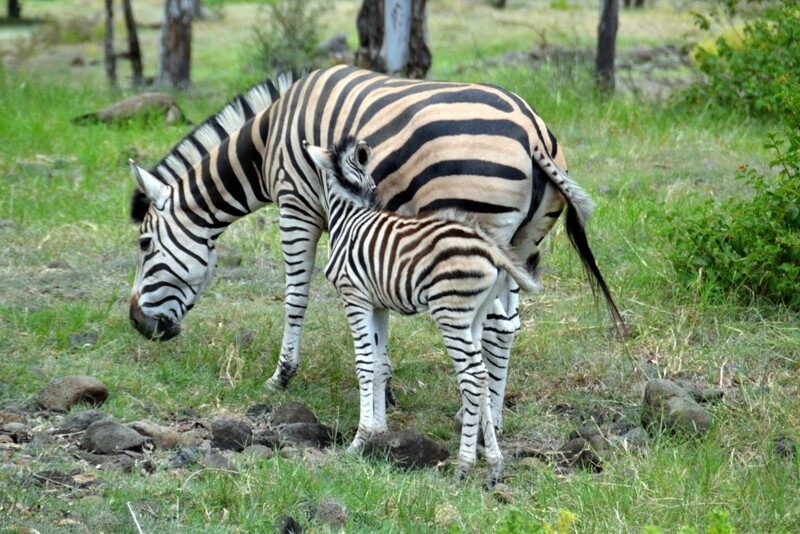 On the vast territory of the park safari tours are organized. From the open bus, you will observe the miracle woods and wild jungles as well as lazy lying big cats and quickly running ostriches not hesitating to look through the bus window and begging for food. For those who feel hungry on the way, nice restaurant is working. Its main feature is the luxury view of the ocean shore. However, a more fascinating view opens from the special viewing platform. You can ride segways and bugs, and thrill-seekers can fly the lianas. Be aware that the services are available for the extra money, but what is the money when we speak about such emotions? Small reservation placed on the south-east cost of Mauritius is the Island of aigrettes (Ile aux Aigrettes). Since 1987, this reservation has been under the protection of Wildlife Fund of Mauritius and is known as a home for lots of endangered species of animals and plants. In fact, there you can come across the giant turtle or gecko, kestrel and pink pigeon. In the period of World War II, English military base was placed on the island. At the same time huge damage was caused to the local woodland, and the most part of it was unfortunately destroyed. After the war, goats and grown acacia were bred on the island. Even today on the island of aigrettes you can observe the last places of coastal wood which in former times covered all the Mauritius cost. Nowadays, thanks to the Federation of Wildlife Fund, the nursery-garden is built on the island for growing young plants of rare and endangered trees, as well as to restore the natural state of flora. This reservation island is an important outdoor laboratory and its main purpose is to recreate and save endemic species of Mauritius flora and fauna. Today all conditions for the revival of the lost paradise are created on the island. On the south part of Mauritius there is the reserve La Vanille Réserve des Mascareignes where 1 000 of turtles and 2 000 of crocodiles live. Their neighbors are different insects, a lot of iguanas, deer and monkeys. The idea to create that reservation in 1985 belongs to Ms Rauntri and Ms Grifits. On the vast area of the park extending on 3.5 hectares tropical vegetation is blooming extensively: from different spices of palm trees to giant bamboo. Giant pandanus and endemic palm trees are the excellent sun protection for the giant turtles Aldabra imported from the Seychelles. These tortillas are the biggest among their class and their weight can be up to 250 kilograms, their shell can be 120 centimeters in length. These turtles can live a long life up to one hundred years. Nile crocodiles live on the island -- one of the biggest crocodiles in the world and they can be seven meters in length and live to be a hundred. You will not meet such giants in any of the other zoo in the world. 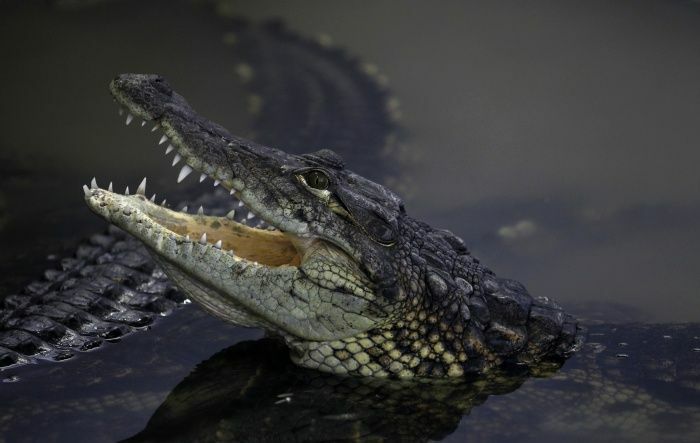 One crocodile shall eat 120 (!) kilograms of meat and it weights 500 (!) kilograms. Mister Mons Jacques Siedlecki has assembled the biggest collection of insects and butterflies on the planet. The beetles, leafhoppers, wasps, bees ... that unique collection was created for more than thirty years, and you should believe that there you will find enough to see. Located in the south-western part of the island and covering about 3.5% of the total area of Mauritius, the Black River George National Park is the only one in the country. It houses 311 from nearly 700 plant species occurring on the island and endangered endemic species like the Mauritius kestrel, the pink pigeon and the Mauritius parakeet and many others.